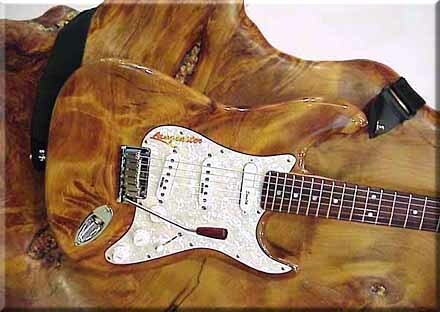 The oldest wood ever to be used for the making of a electric guitar ! 35000 years old. and a height of over 50 mt. It can grow to be over 3000 years old and is a protected species. 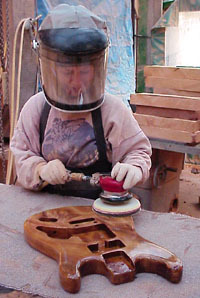 Swamp kauri refers to kauri timber which has been recovered from under the ground. It comes from forests which were buried by natural cataclysmic events long ago. Carbon dating has indicated that logs were buried up to 50,000 years ago. The term "Swamp Kauri" tends to suggest that Kauri trees grew in swamp areas. This was not the case, but rather the reverse as Kauri could not stand 'wet feet'. Over millions of years there have been great geological changes in New Zealand, involving the ice age, earthquakes, eruptions severe gales, vast floods, catastrophic landslides even continental plate movements. Forest trees were overwhelmed by the varying forces of nature. 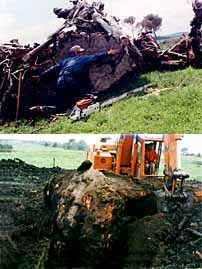 Kauri of all ages and sizes were swept from the forest hillsides ending up in the lowland swamps, eventually to be covered by river silt and subsequent landslides to remain in a state of preservation. 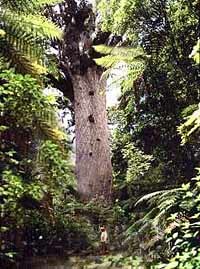 The story of the New Zealand Kauri began 150 million years ago when Gondwana Land began to break up. This left New Zealand isolated and free to evolve it's own vegetation. Today, Kauri forests are the descendants of a succession of Kauri forests s going back 65 millions years, as confirmed by fossil trees and gum found in archaeological excavation. Northland farmers working their land for many years have unearthed immense logs, some bearing the typical scaly bark and leathery spear shaped bronze-green leaves still intact as they are cleared from the peat. In the sunlight of he twentieth century the leaves and bark disintegrate within minutes, but the wood is still preserved, only darkened a little with the passing of centuries. 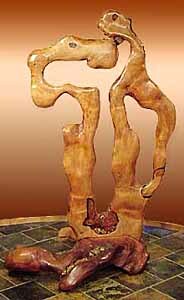 Creating a body from a Kauri stump to make into a work of art. 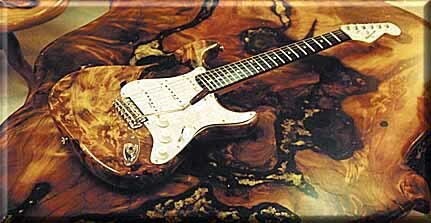 Kauri guitar bodies are works of art and used exclusively on Langcaster guitars. We developed a special treatment to stop the solid wood body from cracking and it is coated with layers of epoxy, then several high gloss lacquer finishes are applied creating a hard high gloss surface . 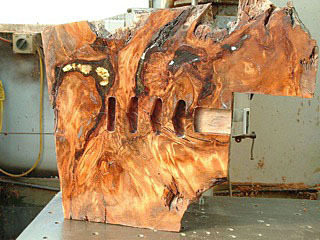 The Kauri wood we used is carbon dated and identified to be over 35000 years old. 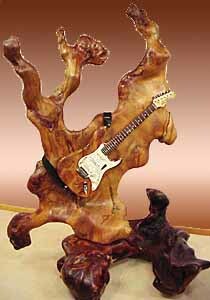 This makes your guitar unique in the world and a collectors item . 4.1 percent and radial shrinkage is 2.3 percent.